If you haven’t figured it out by now throwing a party takes a lot of work and requires a lot of things (tables, chairs, plates, etc). The only real feasible way of pleasing all of your guests is to rent these things as buying would be too expensive and very few people have the space or budget for such a thing. Everyone rents for parties. I can’t remember the last wedding I went to that didn’t have rented items. Even when I worked for my uncles’ catering business, we would rent items to serve guests. Catering to your guests is made easy by renting everything you need. When it comes to the food, whether you’re a caterer or a party planner you need to rent the right items to properly serve your guests. 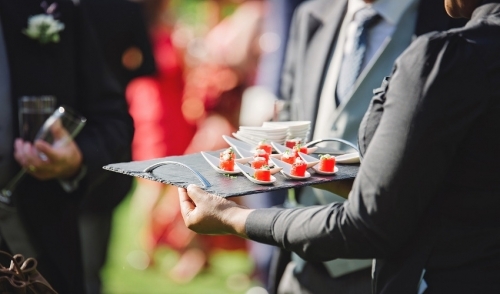 I know what you might be thinking – You’ve catered an event before and you know all the tricks. That may be true to some extent, but what you might not know is that renting for buffet options can help you take the event to the next level. Plates, serving utensils, and chafers can really add up to own, but are only a fraction of the actual cost to rent. Depending on the type of event, for the next buffet you’re most likely going to need a large number of plates. Guests at events often feel uncomfortable reusing the same plate and will often leave the dirty one at the table for the waiter to grab and pick up a new one in line. Some guests may not want certain foods to touch so they might even go through the line with more than one plate in hand. The bottom line is you’re going to need a lot plates, especially if there’s not a dishwasher on hand to recycle clean plates back to the buffet. You won’t need as many serving utensils as plates, but proper utensils for the right foods is important. Make sure to have perforated spoons, regular spoons, spaghetti forks, and tongs where applicable. Don’t worry too much about eating utensils. For most buffets, organizers opt for nice plastic silverware that can be easily disposed. The most important item to rent for any buffet is the chafer. Chafers come in many styles and sizes. Rent the ones that best meet the needs and themes of the event you are catering for. Chafers are crucial to keeping the food hot and making sure everything is served in the correct order. Other buffet items to rent include heat lamps, carving boards, soup chafers, and urns for hot water and coffee. Take your catering up a notch with renting the correct tools and supplies. Nobody wants to eat off paper plates nor spend a lot of money. Make things easy and contact your rental dealer today to serve up a buffet your guests will remember.